There is no doubt that gaming notebooks like the Alienware 17 polarize opinions. Some might call them expensive toys with no value-added features; others get excited about mobile high-tech gaming machines with top-notch components. The company Alienware does their part to fuel the discussion about the various pros and cons of gaming machines. The newest member of the 17-inch series enters the ring with modern Haswell components, 16 GB of RAM, and Nvidia's highest-end GTX 780M with 4 GB of high-speed RAM. Customers can alternatively also opt for 32 GB of system RAM. To ensure a great user experience, the notebook uses a 256 GB SSD as the Windows 8 OS drive, while a 750 GB WD Black hard drive provides room for data storage. A Full-HD display, a sturdy chassis, and configurable light effects round out the not exactly inexpensive package. The Alienware 17 is also available with a less powerful GPU and less RAM, no SSD, and a weaker CPU for 1349 Euros (~$1800). Our particular model, on the other hand, sells for a steep 2464 Euros (~$3300). Therefore, while the parent company Dell offers less pricey options, we are looking at one of the most expensive configurations for our review. All that money buys very high-end hardware and even those not interested in gaming rigs are likely to be impressed. Opening the voluminous box is going to be an experience for those not familiar with Alienware products, as the high-end notebook is secured and packaged in thick and protective foam material like a device a movie villain might intend to end the world with. There is no question that the first impression is a good one. How well the Alienware 17 handles our various tests and how it compares to other established competitors like the Asus G750JH or the MSI GT70, is the subject of our review. Sitting next to a less powerful 17-inch gaming notebook, the Alienware 17 looks to be a heavy and unwieldy beast. Compared to the Alienware 18, the smaller model with its weight of 4.4 kilograms (~9.7 pounds) seems downright manageable though. 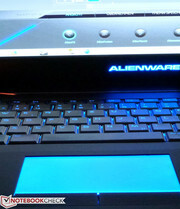 Nonetheless, carrying around the Alienware 17 is not for the faint of heart. Large dimensions and the substantial weight aside, the Alienware 17 is a superbly constructed premium notebook. The lid made from anodized aluminum can take a beating, and the inside areas feature a nicely rubberized coating. Fingerprints and grime are easy to remove. 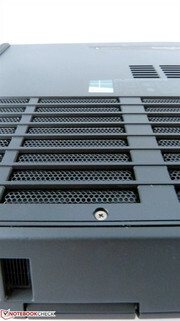 A decorative strip of metal surrounds the base unit. While this strip of aluminum is not very dominating in appearance, the various light effects certainly are far from subdued. 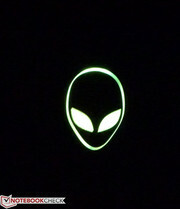 Alienware does not hold back in that regard: the lid, the perimeter of the chassis, the keyboard, the touchpad, and even the power connector - all can be illuminated in different colors. It is even possible to let the various elements pulsate in case of incoming emails. Despite this apparent effect-overkill, the chassis itself is very high-end and the build quality superb and appropriate for the price. The heavy-duty and stiff hinges are just par for the course. Owners of the Alienware 17 will not have to worry about ruining their notebook just because they did not handle it carefully one time. Torsional stability is also top-notch: those strong enough can hold the system on one end without having to fear any damage to the internal components. Alienware must at least employ some gamers in their design department. Looking at the way the ports are distributed, all of the designers appear to be right handed, however. Most of the ports are located on the left edge of the notebook. There is a Kensington lock slot and the power jack towards the rear, a combination HDMI in/out and a Mini-DisplayPort in the middle, and 2x USB 3.0 as well as three audio jacks towards the front. 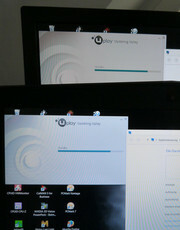 Since the Alienware 17 supports HDMI-in, it could also be used as an external monitor for a gaming console, for example. The ports on the right side are perfectly situated for a right-hander using an external mouse, as the Gigabit LAN port and 2x USB 3.0 ports are pushed all the way to the back. Towards the front on this side, the notebook houses a slot-load Blu-ray drive and an SD card reader, which is located right above it. The front edge of the notebook is home to two speakers from audio specialist Klipsch; the back has no connectivity. The display bezel houses a 2-megapixel webcam with an integrated stereo microphone. For communication with the outside world, Alienware uses a Gigabit network adapter from Qualcomm Atheros (Killer e2200) and a WLAN module from the same manufacturer. While the LAN port does work very well with low latencies thanks to the Killer technology, the wireless adapter is a bit speedier than what we commonly see. 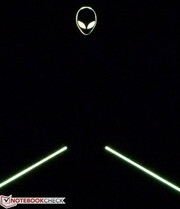 The Alienware 17 ships with an 802.11ac module (2x2), which, as long as the router also supports the standard, is capable of theoretical transfer rates of up to 867 Megabit per second using the 5 GHz band. Of course, the module also supports 802.11n at up to 300 Megabit per second. We had no issues with compatibility with various 802.11n routers (VMW, TP-Link, and Netgear), but we did not have a suitable router to check 802.11ac connectivity. Our non-scientific distance test showed no problems with reception quality between our router located on the top floor and the laptop on the ground floor of a single-family dwelling. The wireless module also supports Bluetooth 4.0. 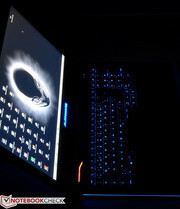 The preinstalled software carries the "Alien" theme a little further: AlienAutopsy handles system information, AlienRespawn is responsible for backup and restores, Alienware TactX allows the user to assign commands to the macro keys above the number block, and AlienFX can be used to adjust the various lighting effects. 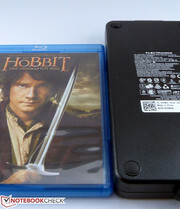 Dell also includes a PDF reader, Adobe's Flashplayer, and the Blu-ray and DVD media suite PowerDVD 9.6. Accessories are a weak area, however: aside from a few DVDs with drivers and tools, Dell only includes various pamphlets. The OEM version of PowerDVD did not want to play our Blu-ray movie without several mind-numbing updates. An advertisement suggested upgrading to a more current version for around 50 Euros (~$65), which we ignored of course. Considering that this is a notebook that retails for around 2500 Euros (~$3300), incomplete software functionality is not something the user should have to deal with. 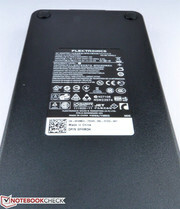 Dell made some concessions to those users who like to tinker with their notebooks: after removing only two screws, a majority of the bottom plate can be removed; the term "maintenance hatch" is clearly insufficient. After the quick removal of the bottom plate, all hardware components are easily accessible. Both the fans for the CPU and GPU can be removed, since they come with plug-in connectors. An open slot provides room for an additional 2.5-inch hard drive; one slot is occupied already. The Blu-ray optical drive can be easily removed, as is true for two of the four RAM slots and the WLAN module. Accessing the secondary RAM modules or the mSATA SSD is a little bit more complex, as these components are on the other side of the motherboard and require removal of the keyboard. Those users who need more than 16 GB of RAM might be better off to order the system with 32 GB. The same is true for the SSD: if a capacity of 256 GB might not be sufficient down the line, the user can opt for 512 GB instead. The standard warranty is 12 months, but because of a law in Germany Dell has to offer 24 months total. For between 180 and 380 Euros (~$250 to ~$500), the warranty can be extended to 24, 36, or 48 months. Dell also offers accidental damage protection for between 55 and 175 Euros (~$75 to ~$240). Repeated losses during a multi-player gaming session should not be blamed on the keyboard, as its overall quality is superb. We did not notice any flex and typing as well as gaming are a pleasure. Ghosting is not an issue; mistypes due to finger slips during stressful situations are also rare since the keys are slightly concave and textured to boot, thus ensuring that the fingers stay in place. The feedback of the keyboard is also good, thanks in part to the decent size of the keys. 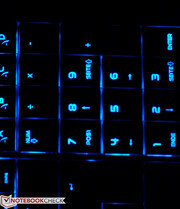 The area above the numeric keypad is home to four macro keys, which can be assigned three different functions each. The Fn-key provides additional functionality, as the F-row keys can be used to change the brightness and the speaker volume, turn on the WLAN, or change the active GPU in battery mode. 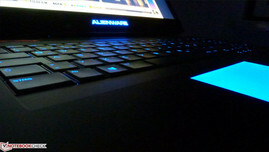 The Alienware 17 also comes with a very good and strong keyboard backlight. The software allows the user to configure four different zones, which can be adjusted individually. Some very out-of-the-ordinary color combinations are possible. 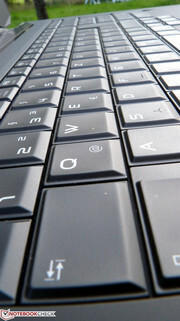 The touchpad is very large, recessed slightly, and allows fingers to glide easily and reliably. Adequate cursor control is definitely possible in a pinch even without the aid of an external mouse. 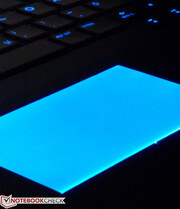 Just like many other parts of the notebook, the touchpad also lights up. 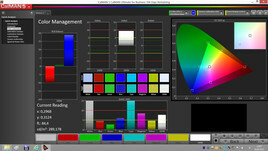 Unfortunately, the user can only adjust the color, but not the brightness level. 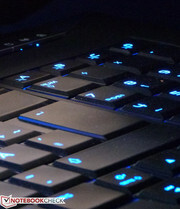 At night, the touchpad is very visible, although the light deactivates after a set period. Aside from normal mouse functionality, the touchpad also supports multi-touch gestures, which are not activated by default. It is advisable to spend some time adjusting the gestures in the driver panel right after starting up the notebook for the first time. 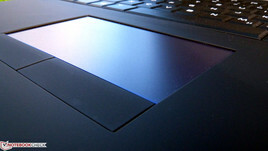 Unlike many other notebooks, the touchpad of the Alienware 17 still comes with separate mouse buttons. They work quite well and the click-point quality reminds us of the keyboard itself. Instead of the Super-PLS screen Dell equips the Alienware 18 with, the Alienware 17 needs to make due with a more conservative TN panel. The 17-inch notebook is not affected by the screen "burn-in" reported by users of the 18-inch system, but viewing angles are not nearly as extensive. We like the matte screen with its 1920x1080-pixel resolution. 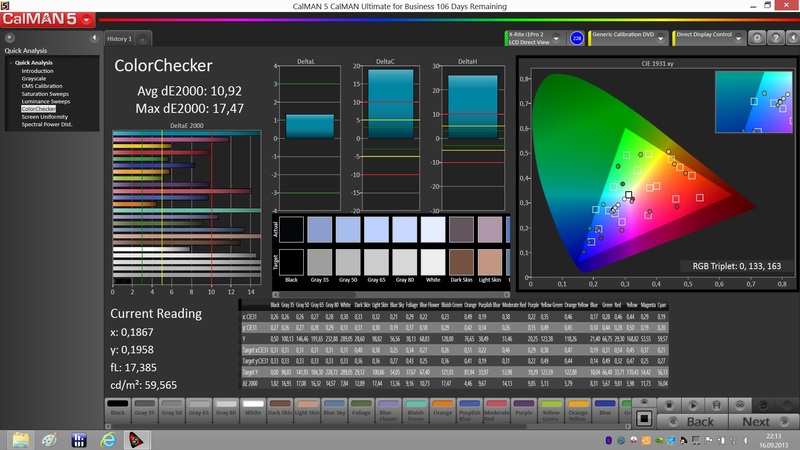 Since the screen is not glossy like on the Alienware 18, the substantially lower brightness of 269 cd/m² in the middle is less of an issue even in more brightly-lit environments. Our review model also does not score as well as its big brother as far as color reproduction is concerned, since the display is on the cool side and exhibits a distinctly bluish cast. 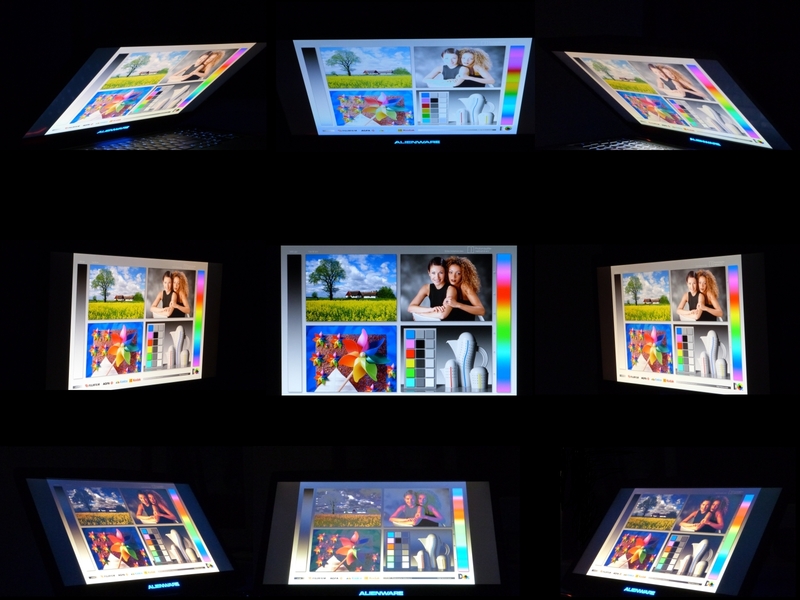 Although color reproduction is quite decent, the notebook is not very suitable for professional graphic artists. 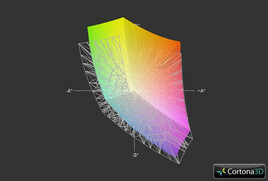 Even though the monitor covers about 97% of the sRGB color space, the less-than-stellar viewing angle stability results in a degraded picture quality when the user deviates from the perfect perpendicular axis. The black value of 0.44 cd/m² is actually quite good, although we discovered some minor bleeding in the upper and lower display edges. 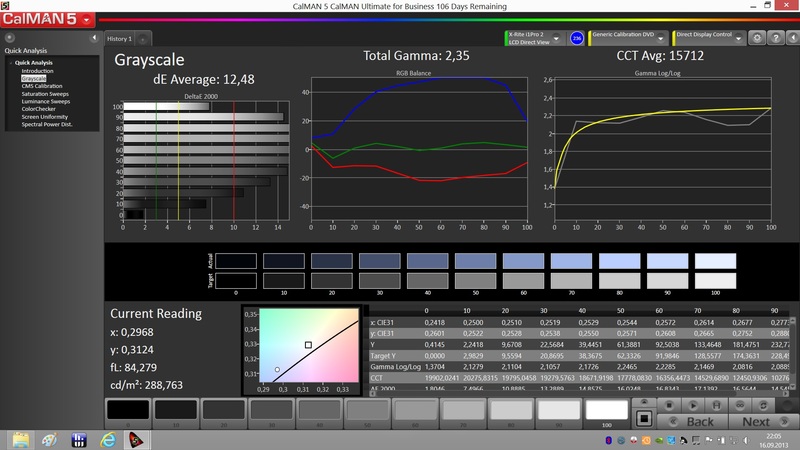 The display panel is matte and decently bright. Especially when looking at dark screen content, direct sunlight is out of the question as it is almost impossible to decipher any text on the display. Turned away from the sun or in the shade altogether there are no issues with readability. The notebook is capable of a maximum brightness of 264 cd/m² while running on battery and thus suitable for brighter environments (for example, when the light is coming from behind the display). We really appreciate the fact that Alienware decided on a non-glare screen, especially since the colors are quite vivid. Gamers are unlikely to use makeup anyway, so a glare panel just makes no sense. In a last minute decision, Dell went with a PLS display panel for the Alienware 18, while the smaller 17-inch model has to make do with older TN technology. The viewing angles are therefore limited: deviations to the side or too severe angles from below and above should be avoided. The colors deteriorate rapidly and eventually invert completely. If there is one area where a gaming notebook needs to convince the user base, it is performance. In the best-case scenario, the system should be able to function as a desktop replacement. Not all expensive notebooks are capable of this feat, but the Alienware 17 is very impressive in that regard. The amply-sized and speedy SSD allows Windows 8 to handle daily tasks smoothly and without any annoying delays. The quad-core CPU has more than enough computing power and is not much slower than a hot-running and full-sized desktop processor. Turbo Boost is responsible for the relatively small performance gap between the desktop and the notebook i7 processors despite the lower frequency of the notebook versions: because of the Turbo, the Alienware 17 usually maintains three Gigahertz during gaming sessions. 16 GB of RAM should also be more than sufficient, as there is not a game on the market that can take advantage of even that much. In addition, the Nvidia GeForce GTX 780M can access 4 GB of dedicated GDDR5 VRAM. Overall, the Alienware 17 does not behave much differently than an even higher-end desktop system would. Of course, benchmark tests reveal a slight disadvantage as far as performance is concerned and some games can show the limits of this mobile gaming platform. Nevertheless, the Alienware 17 is perfectly suited as a desktop replacement, if the user also needs to run "serious" applications in addition to games. Unlike the Alienware 18, our review model is not equipped with the expensive top-model Core i7-4930MX, but features the slower Core i7-4800MQ. The CPU is manufactured using the 22 nanometer process and is a member of the Haswell processor generation. The four physical cores are "virtually doubled" using Hyperthreading. This technology from Intel ensures a better utilization of the cores and is the reason why eight processing units show up in the control panel. The i7-4800MQ has a base frequency of 2.7 Gigahertz, which does not look impressive at first. Because of Turbo Boost, the CPU can overclock to 3.7 Gigahertz if needed - although when more cores are in use, the maximum frequency drops. The technology ensures that the mobile CPU does not appear to be much slower than the desktop versions with a TDP of 77 Watts. 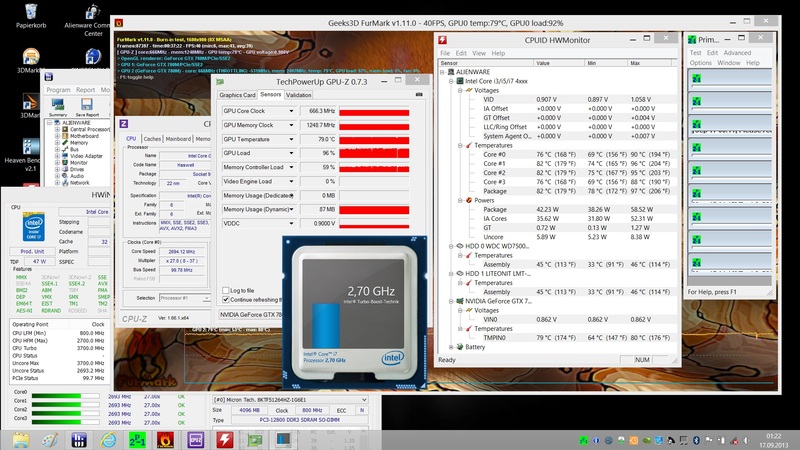 The i7-4800MQ with its integrated HD 4600 GPU only consumes 47 Watts. Haswell CPUs have a somewhat split personality: during idle, the current-generation processors impress with low power consumption. Under full load, however, the CPUs get quite hot and can push various cooling systems to their limit. Alienware definitely had their work cut out for them in order to deal with the heat of the i7 in such a way that it did not impact performance. Spoiler alert: the company was able to achieve this goal for the most part. Although the processor cannot sustain the maximum possible frequency during the stress test with FurMark and Prime95, we have to add that this scenario is extremely unlikely during regular use. Even after several hours of testing, we never saw any evidence of throttling, as the CPU maintained at least 2.7 Gigahertz. Our worst-case scenario had the CPU hovering at 2.9 Gigahertz with brief dips down to 2.7 Gigahertz. Games did not tax the cooling system quite as much, as we recorded higher average CPU frequencies compared to the stress test. Even the very demanding Metro: Last Light did not push the notebook to the limit, as we still observed at least 2.9 Gigahertz. During single-threaded benchmarks, Turbo Boost maintained a frequency of between 3.5 and 3.7 Gigahertz. During the Cinebench benchmark tests, the 4800MQ clearly showed its power: the Alienware 17 placed in the uppermost part of our benchmark database. It was not quite able to reach reference-status, as some processors have higher clock speeds. On a daily basis, the slight theoretical disadvantage of the 4800MQ is not noticeable at all. During our tests with the various PCMark benchmark tests, we did not notice any abnormalities: performance is consistently high and comparable to the performance of the best notebooks we have ever reviewed. The additional money for the faster and three times as expensive Core i7-4930MX or the almost twice as expensive i7-4900MQ is not money well spent, as the performance difference is measurable, but just not that noticeable. In our book, Dell's decision to go with the Core i7-4800MQ is a good one, even though a high-end processor would have been more prestigious. The SSD does its part to ensure a speedy system. 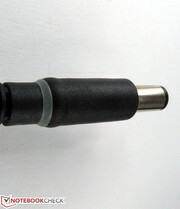 The capacity of 256 GB is sufficient for the OS and frequently used applications. The PCMark tests are particularly sensitive to hard drive speed and reward the presence of SSDs with substantially higher scores. The 16 GB of RAM are less noticeable, but should be considered an investment for the future. Users who buy a high-end notebook like the Alienware 17 would probably also prefer to have a little more RAM than the rest of the "average" notebook users. In addition to a 2.5-inch Western Digital conventional hard drive (WD7500BPKT-75PK4T0), our review model also includes an mSATA SSD. The performance is consequently very good and the Alienware 17 always responds smoothly and quickly regardless of the situation. Even the regular hard drive is no slouch: the 750 GB Western Digital Black features a spindle speed of 7200 RPM and is therefore suitable not only for data storage like music, movies, and photos, but also for the installation of games. The results of 110 MByte/sec maximum and 87.4 MByte/sec average (HD Tune) are quite decent for a platter-based drive. The SSD from Liteon (LMT-256M6M) has a capacity of 256 GB and is of course significantly faster: with an average transfer rate of 350 MByte/sec, the flash-based drive can handle a lot more data concurrently. 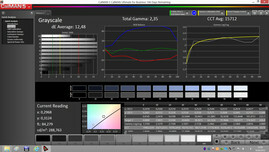 Especially important for the subjective performance is the access time, which is very low at 0.1 ms (HDD: about 20 ms). Instead of a power-hungry SLI combination, Alienware opted to use the fastest single GPU from Nvidia for the 17-inch model. The Kepler-based GTX 780M has 1536 shader units, is built using a 28 nm process, and can access 4 GB of GDDR5 RAM using a 256-bit interface. In 3D-mode, the GTX 780M runs at 823 MHz, but can overclock to 849 Megahertz thanks to GPU Boost. Under maximum load while running calculation-intensive applications like FurMark, the frequency drops to 666 Megahertz. Alienware obviously did not want to subject the battery to a power consumption of 100 Watts, as the GPU is subjected to throttling while the notebook is away from the outlet: with a core speed of 405 and RAM speed of 800 Megahertz (vs. 1250 Megahertz), the GTX 780M now only delivers a fraction of the maximum possible performance. Although the GPU is still comparatively speedy, frame rates drop by 50% in many games. A benchmark test with Tomb Raider illustrates the observations above clearly: with the notebook connected to external power, we recorded 68 fps for the ultra-preset, with the notebook on battery only 28 fps. Metro: Last Light is more or less unplayable at 17 fps on battery power with very high details and at the native display resolution. When the notebook is once again connected to power, the frame rate jumps back up to 39 fps. Nvidia's GTX 780M is the perfect gaming solution for powerful, high-end notebooks. The aforementioned power consumption of 100 Watts is too high for mobile use, but the performance of the DirectX 11 GPU is awe-inspiring. Together with a fast Haswell CPU, plenty of RAM, and a fast SSD, the notebook is decidedly high-end and offers performance comparable to many desktop PCs. Aside from very few exceptions, the Alienware 17 handles most current games fluently - although "fluently" does not always mean 60 fps. We noticed some fps-induced stuttering when we played Metro: Last Night at about 39 fps, for example. Nothing lasts forever: the upcoming game Watchdogs will probably push the GPU to its limit. 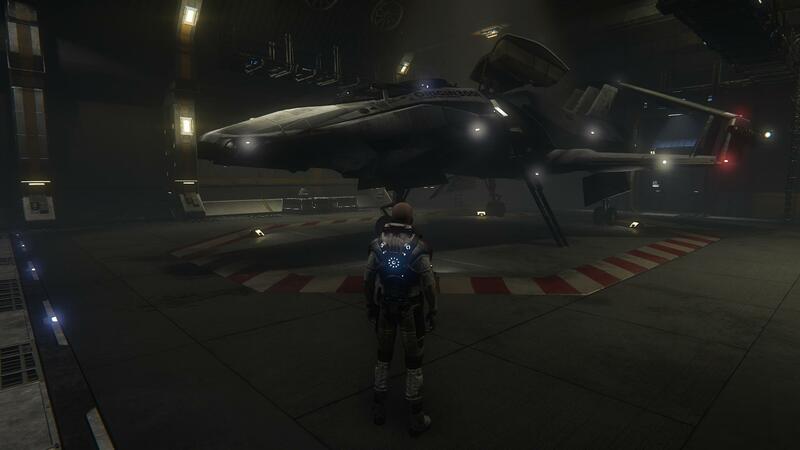 In addition to our standard gaming tests, we also checked out the hangar module of the upcoming (2014) Chris Robert's game "Star Citizen" and had no issues. The Alienware 17 also handled the beta version of Battlefield 4 well at about 40 fps (multi-player scene with 31 players). Our review notebook is equipped with a 60 Hz display and therefore cannot handle stereoscopic 3D games. Alienware also offers a 120 Hz display for a surcharge. Since the Nvidia driver needs a lot of GPU power for the necessary calculations, performance could be an issue, however. With the notebook on battery power, 3D gaming is probably only possible with the quality settings on low. On the other hand, who would voluntarily wear 3D shutter glasses while using public transportation? To conserve power while on the road, the user can elect to switch to the integrated HD 4600 via an Fn key. The battery life doubles, but the frame rates take a severe hit. Nevertheless, the performance is sufficient for undemanding games like Dishonored. A whisper-quiet gaming notebook is out of the question. We do want to stimulate discussion here - the Asus G750JH at least is a fairly quiet example. To be more specific, we should rephrase our sentence: at this time, it is not possible to build a gaming notebook that remains quiet under load. When subjected to "normal" tasks like web browsing, office work, and video or music playback, the Alienware 17 remains more or less inaudible. Often, the notebook is almost completely silent; when brief loads are encountered, the fan spins up to a maximum of 34 dB(A), which is still acceptable. Under full load, the two fans prove that they are not just designed to hum quietly in the background: we recorded up to 51.8 dB(A), which is very loud indeed. Alienware also was not able to keep the fans at a constant speed: during our gaming sessions, the noise level fluctuated between 40 and 50 dB(A). Subjectively, these fluctuations are a lot more annoying than a steady-state fan noise would be. For gaming, we recommend turning up the speaker volume or the use of headphones to drown out the noise. The designers were able to keep the temperature distribution in check. Even though the area around the fans gets hot, the palm rest and the keyboard remain quite cool even after hours of prolonged use. We recorded a maximum of 54.4 degrees Celsius (129.92 degrees Fahrenheit) during the stress test on the bottom of the notebook. The top reached a maximum of 36.8 degrees Celsius (98.24 Fahrenheit) in the area of the CPU and GPU. Both the keyboard and the palm rest topped out at 35 degrees Celsius (95 Fahrenheit) (middle of the keyboard) and 28.8 degrees Celsius (83.84 Fahrenheit) (touchpad). Overall, the Alienware 17 stays remarkably cool for a notebook offering this level of performance and none of the recorded values are any reason for concern. During idle, the underside of the notebook reaches 33.8 degrees Celsius (92.84 Fahrenheit). Given an ambient temperature of 22 degrees Celsius (71.6 Fahrenheit), the result is also quite acceptable. The advantage of Nvidia's Optimus technology also comes into play here: the power-hungry GeForce GPU is not active when no 3D load is present. The Haswell architecture also contributes positively: although Haswell CPUs can get really hot under load, they stay very cool during idle. (±) The average temperature for the upper side under maximal load is 32.6 °C / 91 F, compared to the average of 32.9 °C / 91 F for the devices in the class Gaming. (+) The maximum temperature on the upper side is 36.8 °C / 98 F, compared to the average of 39.3 °C / 103 F, ranging from 21.6 to 68.8 °C for the class Gaming. Although the Alienware 17 only comes with stereo speakers and not a dedicated subwoofer, the speakers are noteworthy as they are made by the renowned audio company Klipsch. 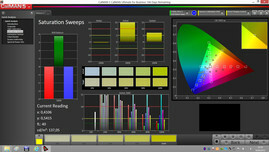 The notebook also ships with sound optimization software, which allows the user to tailor and optimize the sound quality and switch between different settings. We have seen in the past that a well-known name does not guarantee good speakers and sound. Alienware obviously did not neglect this area, as the sound quality of the Alienware 17 is very decent. Even at low volume levels, we were able to clearly distinguish the nuances. We also had no issue with the sound quality when we turned up the volume, although the speakers start distorting at around 75%. The maximum volume level is not quite sufficient for large-sized rooms. The speakers from Klipsch are lacking deep bass, however, so users who want hard-hitting lower frequencies should use headphones or external speakers instead. Mids and highs are very good, so listening to music is not out of the question. Of course, due to the design restrictions, no notebook can compete with dedicated speakers. Even while playing games, VoIP conversations as well as other sounds - like explosions, for example - are clearly audible. The speaker system offers a wide enough sound stage, so it is fairly easy to localize sound (a tactical advantage for multi-player shooting games like Battlefield 4). We do not consider the lack of a surround sound system to be a big issue. We prefer good stereo speakers to a "just average" 5.1 speaker system. Moreover, the surround-sound effect of speakers located under a notebook is probably questionable at best. Since powerful gaming notebooks like the Alienware 17 cannot compete with the law of physics and therefore require a lot of power during high-intensity sessions, it is not surprising that Alienware included a power adapter with 240 Watts. The dual-GPU Alienware 18 ships with a 340-Watt power adapter. 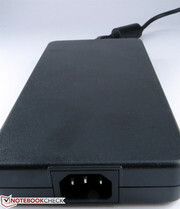 The output of the power adapter is actually necessary, as the Alienware 17 consumes more than 200 Watts under load. The difference between low and high load levels is interesting. Dell's designers did good work here: Haswell's very good power-conserving strategies and Nvidia's Optimus technology lead to an idle consumption of only 21.8 Watts (brightness turned all the way down, WLAN deactivated). With the brightness turned up all the way and wireless active, we recorded 29.1 Watts. With the performance profile selected, consumption jumps to 36.2 Watts, since not all CPU energy-saving functions are enabled at this point. 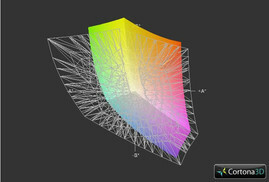 When the notebook is tasked with 3D loads, the picture changes. With 3DMark 06 running, the Alienware 17 now needs 120 Watts. Graphically intensive games like Crysis 3 will probably require even more power, although it's unlikely that any game will come close to topping the 204.7 Watts we recorded during our stress test (FurMark and Prime95), as no current game is as demanding on the hardware as this synthetic stress-test bundle. During all of our tests, we left the notebook backlights (keyboard etc.) on. Presumably, a few Watts could be saved with the lighting effects turned off. The (very potent) battery has a capacity of 86 Wh. Because of the various power savings options, the notebook lasts about four hours during idle. Since the Alienware 17 is by no means an Ultrabook, which should last a whole day on one charge, the result is more than adequate. With the display brightness turned up and the wireless modules active, the notebook shut down after 2 hours and 36 minutes during our WLAN test. For this test, an automated script visits a new website every 40 seconds. Yet again: for a powerful behemoth like the Alienware 17, the result is quite impressive. As soon as the load increases, the notebook has to pull all its strings to get adequate run times. During the Battery Eater Classic Test as well as during our gaming session with Metro: Last Light, the system only lasted for about an hour each before we had to recharge it. It is important to keep in mind that the GPU performance is severely reduced when the notebook is running on battery. Considering the power consumption, reducing the GPU core frequency is certainly a valid measure - a notebook with a battery life of just a few minutes does not really make any sense. Since the battery is screwed in, the removal requires a considerable amount of effort, which is highly impractical. Gaming notebooks polarize opinions. Some think they are expensive, do not make a lot of sense, and are not fit for travel in the first place. Others like the usability: a notebook is inherently more portable than a desktop and perfect for LAN parties. The truth is, like so often, somewhere in the middle. The Alienware 17 is not overly portable given the considerable weight of 4.4 kg (9.7 pounds, without the power adapter). The high power consumption also restricts the time that can be spent away from an outlet. The notebook does its job extremely well as a desktop replacement, however. The design is well thought-out, as the port placement and ease of maintenance show. All components are easy to access, which should make upgrading down the line possible, should the hardware not be sufficient any longer. The lighting effects are a matter of taste, but probably appreciated by the target audience. Where there is light, there are shadows. In this case, the shadows are not caused by the numerous LED lights, but the rather average display quality and other issues like the GPU throttling under very high loads. All things considered, the Alienware 17 is a very high-end, well constructed, and very fast gaming notebook. More or less all current games can be played at 40 fps with details set to high and at the native Full HD resolution. Those willing to spend a lot of money are not going to be disappointed with the performance. Compared to the direct predecessor Alienware M17x R4, the higher performance is noticeable and appreciated. 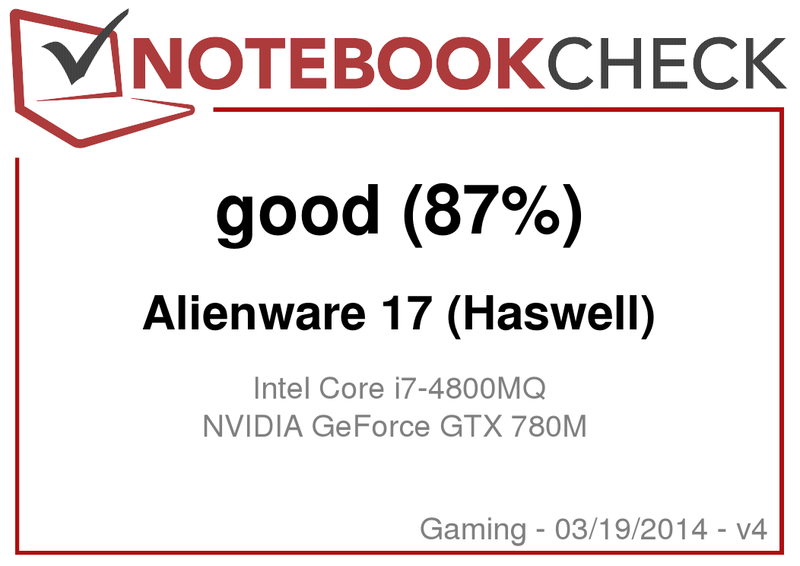 The Alienware 17 also beats the MSI GT70 in many areas. The most compelling competitor is still the Asus G750JH. Did we mention that the touchpad lights up? Lots of power and very high build quality. This is how a gaming notebook should be! A better display would be nice. We would also appreciate a redesigned fan control so the fans pulsate less. The Alienware 17 is so colorful, the party room doesn't need disco lights. MSI has the GT70, Asus the G750JH. 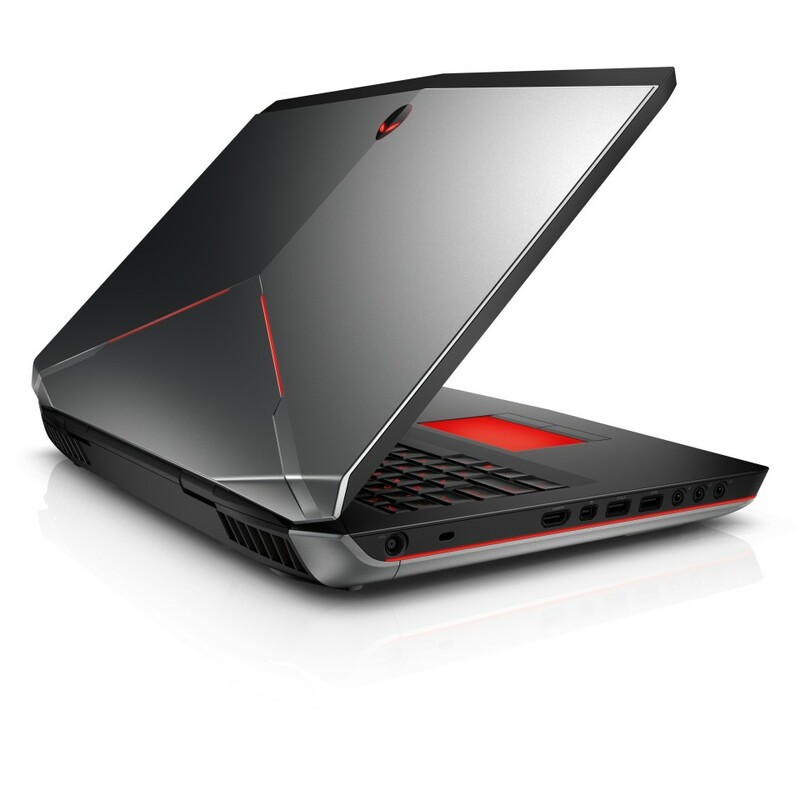 Compared to those models, the Alienware 17 just seems to be a more thoughtful design. Even the predecessor Alienware M17x R4 is a step behind the current model.